Merging of Skills and DNA- What skills do you think should be merged? What DNA? Modifying Existing Skills Trees and DNA- What skill feels like it needs a small modification to make it viable? Sooo... You want like one month on one class? It will take you more than half year to rebalance all classes, lol... but ok.
Druid has a lot of good skills from BM, im talking here about stuns and multi target skillis, which make from druid really high dps, and everyone know- it's just to OP. So i don't know how you gonna do it, but... You have just 2 options- block few skills from BM for druid, or change skills. You should look at second jobs too... It would be more easy, if we could post here our ideas about elemntalist and druid too. but w/e, better to waste like 1 month just on one class. Sorry for the offtopic, but I agree with Nikio. Is this some kind of stalling tactic to keep us around? why not make all class per week? When I mean by class, I mean it by BM + Druid and Elementalist, the class and its' sub-classes. Sorry this might be a little off topic, so then each class is gonna take a month to reskill so are we gonna be looking at 8 months before we can have skill resets or job changes then or well we get that after each rebalance of each class, as your talkiing about changing things again hopefully for the better wish you would just make more classess able to solo farm bossess as the game is dead unless there is some kind of exp event going on. does this Skill really stack with Thrown Vine? please confirm. -> if not make sure that it is stackable. (old) Increase yours and target's Max HP for a set duration. he gets an Stealth Detect but loses a Heal and Debuff remover. not much looking into the DNA yet. Nice suggestion there Sandy however i do have one question. Why does BM's get all the multi-elemental attacks instead of Elementalist (duh) getting them, they only get snow burst or whatever its called. Some skills needs to be plucked out of the BM tree and moved over to Elementalist and no to clairvoyance to BMs, druids can just cast CV, go into doom guard and chill, that's a tad bit OP + it would ruin low level FoC for rogues. 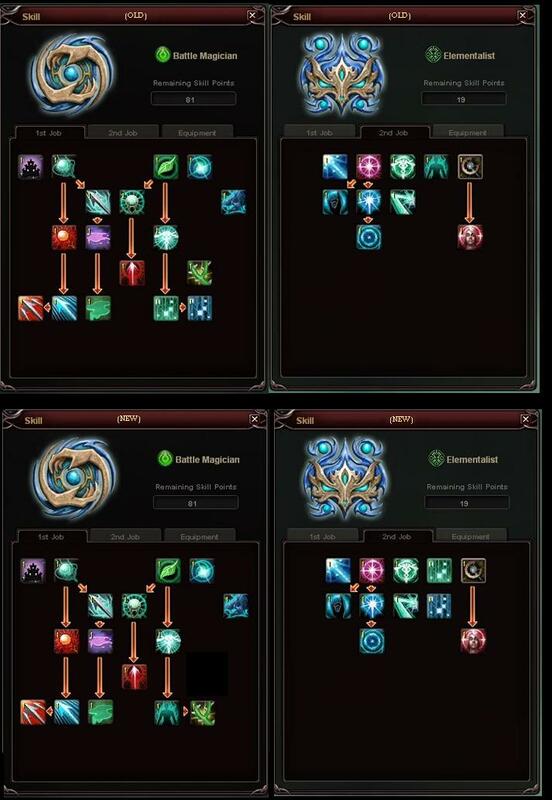 If they truly wanted to make elem great, damage buffs from BM tree won't solve any of this however transferring some elemental skills over to elem would be a great addition to their skill set helping them deal with resistance weaknesses of other players. This is the main reason druids is so often called OP they've got lots of stuns, stun immunity and can hit every single elemental weaknesses except for that snow burst thing. -Sorry, but the clairvoyance switch isn't necessary, you give druid far more utility still because they can chase down rogue based classes the easiest. It shouldn't be like an S1 Elem. -Secondly, just because WoP is OP in 49 doesn't mean most druids run it in the higher brackets, remember it has a success chance at DoT removal now. Personally if you're taking this over the other utility of some druid/elem skills you're doing it so very wrong. -As for WoH, you would have to tweak the numbers on instant healing to make that skill viable. But again, that at higher levels wasn't even close to being my main healing skill... Which is where I make my point of AE. AE is fine untouched, AE is one of the few skills that you have to plan yourself around (whether it be at your standard 25/30 DNA or your 55 DNA points rotation). Personally, you shouldn't tweak that number at all, it's already a 4k+ heal for someone +30 as memory recalls. *Edit* Also changing the damage type is a bit silly too seeing as Robbing Willingness, Raging Strike and Revenge Telekinesis are all physical. It would be as bad as when they changed Flame Curse Strike, and Lightning Chill Slash from Physical. The main problem here and what made druid stronger than it was before were the changes to invisible arrow, throwing waste water, and hydrochloric acid throw (which is 5 seconds cd with max DNA). If you combine the manacosts for doing your regular druid rotation(example being LCT->HCL->MS->WW->HCL->RW->RT->with your optional Approach/IA/FCS in there or HCL x2), you can end up casting about 8 skills give or take with under 1.2k mana burnt; that being said you don't always cast them back to back. These skills are just as great on elem too though they lack the mobility and survivability of a druid. Now the mathematical for the equivalent rotation on a druid with transformation would be Inferno->Advance->Storm Slash->Double Strike->Bleeding. That's about closer to 1.5k mana (this is of course done with maxed skills on your essential damage ones). Pretty much Wreckd has the right idea in terms of the druid's utility, but I don't think you should nerf the transformations, you could make some of the skills on the branches a lot more desirable though. Edited by Viole, 11 February 2013 - 07:05 PM. Good one Viole, i'm personally against nerfing druids transformation but they just have way too much arsenal in tacking weaknesses at the moment due to having loads of elemental attacks at this point. In other words they got too much utility. i don`t think that it would ruin FoC 49 for Rogues cuz. it doesn`t at 69 FoC. you have lets say a 25 Sec Duration but 2,5 min Cooldown into my Eyes a Challenge. to give em something back in return is the stealth. another Point i would like to highlight is to get more into The Race Wars. i thought about the Detect at this moment only. ( i would like to see a Stealth Detection Buff for ONE other Target ! cuz. Resist is kind of to easy to get. Edited by Sandyman, 11 February 2013 - 07:26 PM. Yeah, I really wish they actually made the transformations more desirable for me now. Before I used to run a full build around those rotations, but now I just laugh at the type of build I used before quitting because I used to say I'd never run something like that along with Severed lol. The things that never made sense to me even since S1 were the sub-"buffs" to both forms, they're things that could easily be put into the "contract" skill, like swift arm on Inferno. Though, the Inferno tree isn't as weird as the Doomguard tree. You have a defense buff, an HP Recovery buff, and a random teleport(???). Only thing useful there is the HP Buff, because the taunt is way too low and long of a cooldown to keep aggro on anything if you want to tank. Then there's the change to the Doomguard Heal, which makes it a bit counter-productive to even skill it now too, I would think they would've made it similar to the prot "tick". Yes 49 does have AE. But you also have to keep in mind it has a chance to miss. In order for it to heal the BM using it it has to hit it's target and, much like other skills has a % chance to miss. Instant Heal= Most 49 BMs can't get this skill maxed without sacrificing another skill. Which as a BM you really can not do. You need all the pts you can get for skills such as LCT, WasteWater, Acid Throw, Stuns, Other heals and Defense buff. So at most you will get 4-6 pts on Instant Heal which only heals for about 400-500. Natural Healing- This skill got so f-ed in my opinion unless you max it to 10 pts in 49 (which again most don't to save pts for other skills) You can get it to heal you for 100+ a tick if you are geared correctly. Only issue though is. It only ticks twice. I think the BM skill tree should be left alone. Eley and Druid tree's need work especially the ele tree. But as far as BM goes. I think they are fine where they are at. Simply due to the fact that they are in my opinion balanced enough. They can get kills easy but also can be killed easy. You put a BM up against a Templar for example. The temp wins. Simply due to Sleep/Heal/MP BM vs Temp is a no brainier even if the BM is a good one. If the temp is built just as well BM has no chance. They run out of MP way to fast simply due to Templar's having an MP buff and being the only 49 class that can crit heal themselves for 2000 or more with one heal. My BM for example is a well built BM and it takes me at least three of my heals to equal a Templar's crit heal. And most often than not depending on who the temp is. they have so much crit chance that almost every single heal will crit. As I said this is just my opinion on it. Edited by Mythdra, 12 February 2013 - 07:57 AM. It would be nice if Holy Bliss was a party buff, instead of target only. Its a bit of a pain to buff a big party during raids. In general, needing more skill points, even at lvl 83. I have instant snow burst with dna. looking at druid skills you dont really need a sleep skill with them, as they have many stuns if used right, i know there not like the rogue class but they do have some range over them and in transformation say with like doom guard you can't be stunned, or inferno you can't be confused, Now the ele could use some more attack skills with something like sleep or a higher level stun skill. Now for the BM I think WOH beings it has some time to cast on it i think it should be more like the NH or like the party heal from the radi. Invissable arrow to ele sounds good if you make it a aoe stun and up the chance of stun with it, I know with my druid I dont even use that skill, aint sure what the 49 foc battle tweaks would think of that though, as it would be taken out there long range stun skill. While you guys are at it, please make it so that DNA'ed skills for instant cast also speeds up the casting animation, this happens a lot on forsaker fire totem (instant cast DNA), we can still see them stuck in that very slow casting animation and can get interrupted w/o firing it, same with snowburst or what ts called. I would like to see the skills damage based on the % of attack or the % of the caster's HP in the higher levels of the skill so it is more usable in later levels. I think at later levels we start to use skills for an effect or just to do an attack instead of for its damage.